A new trade fair for the international tire industry, The Tire Cologne took place in Cologne, Germany between 29.05.2018-01.6.2018. 533 exhibiting companies and another 70 brands from 40 countries participated in that premiere. More than 16.000 trade visitors from 113 countries were in that important trade show in total and nearly 60% percent of visitors were from abroad. The upcoming The Tire Cologne takes place from 9th to 12th June 2020. 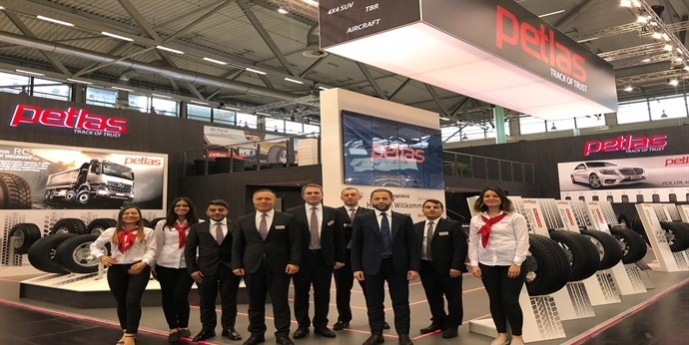 In that premiere Petlas Tire Corp. opened its boost at Hall 7.1 / C018 and has exhibited tires from its comprehensive tire range. PCR, SUV, LTR, TBR, AGRICULTURAL, OTR, MILITARY LAND AND MILITARY AIRCRAFT segments have exhibited during the fair. Especially in PCR (Winter and Summer) and SUV (Winter and Summer) Run Flat tires were captured visitors attention too much.